The popularity of foam rollers is huge right now. 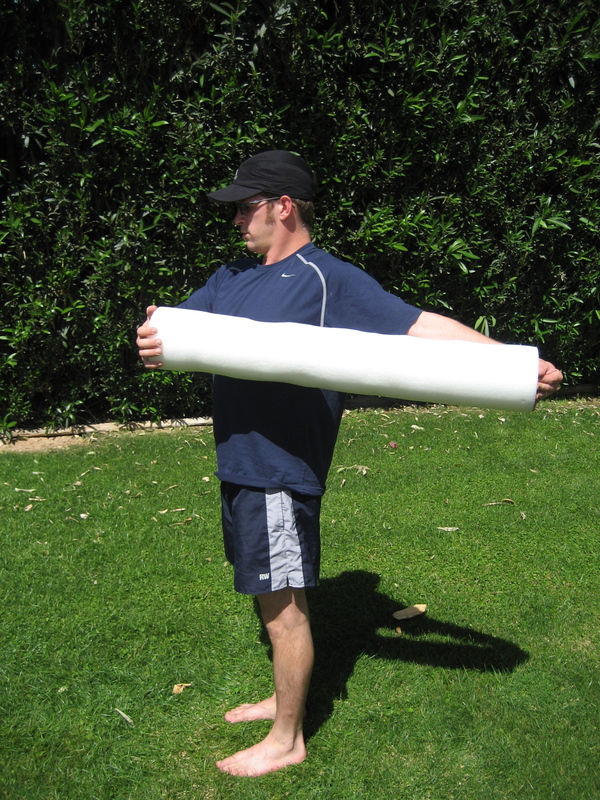 Many people are simply using them for rolling the iliotibial band. 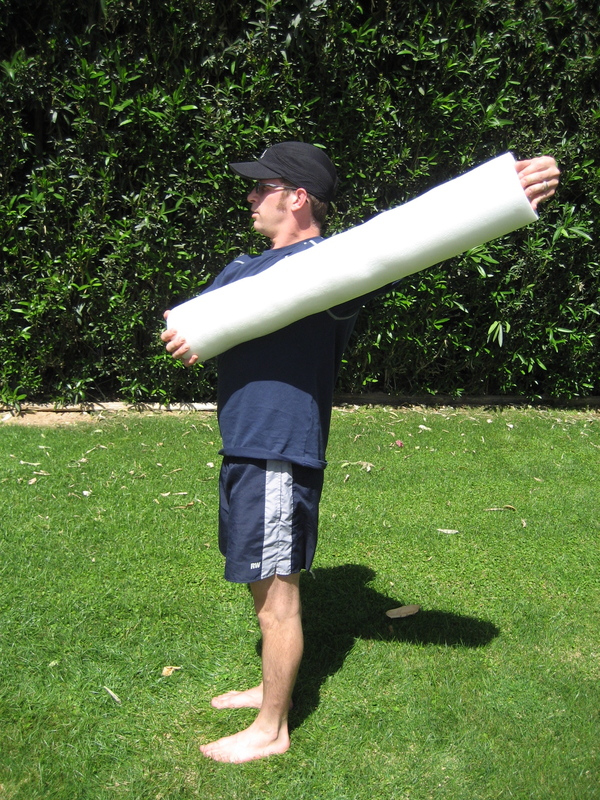 I feel foam rollers can be used for so much more than IT Band – Self Myofascial Release (ITB SMR). This handy little tool can be purchased for around $20 in most towns or on line and requires no gym membership. Lets look at techniques for the pectoral muscles. I recommend these movements for my clients with forward head posture, upper cross syndrome, shoulder, neck and arm pain, and as a preventative measure for all clients. René Descartes (1596-1650) was one of the first to conceive a model of reciprocal innervation (in 1626) as the principle that provides for the control of agonist and antagonist muscles. Reciprocal innervation describes skeletal muscles as existing in antagonistic pairs, with contraction of one muscle producing forces opposite to those generated by contraction of the other. For example, in the human arm, the triceps acts to extend the lower arm outward while the biceps acts to flex the lower arm inward. In order to reach optimum efficiency, contraction of opposing muscles must be inhibited while muscles with the desired action are excited. This reciprocal innervation occurs so that the contraction of a muscle results in the simultaneous relaxation of its corresponding antagonist. The significance of Descartes’ Law of Reciprocal Innervation has been additionally highlighted by recent research and applications of bioengineering concepts, such as optimal control and quantitative models of the motor impulses sent by the brain to control eye motion. Immediately after isometric contraction, the neuro-muscular apparatus becomes briefly refractory, or unable to respond to further excitation. Thus, stretching a muscle immediately following its isometric contraction may incrementally restore range of motion. R.I. Reach back with left arm, activating posterior shoulder and back muscles. Keep hips forward, limit trunk rotation. Gently push end of roller with right hand while maintaining your left arm reach to provide length to left Pectoralis Minor. Hold 2 seconds, repeat 10 times or go for general improvement. P.I.R. Using the angle depicted above, push with the right hand to first motion restriction, you should feel a slight stretch. Maintain pressure with the right ‘push’ hand at the beginning phase of the stretch. Gently, 20% effort, push back with the left hand against ‘stretch’. Hold for 6-8 seconds. repeat 3-5 times or again, go for general improvement. C.R.A.C. If you really want to get fancy, try CRAC, Contract~Relax~Agonist~Contract, alternate between the two above procedures. First reach back with left, stretch by pushing with the right. 2 second hold, then push with the left hand against pressure. 6-8 second hold. Reach back again with left hand, 2 seconds and so on. By slightly changing the angle of the direction of force, you will manipulate a variety of tissue. For the clavicular head of pectoralis major, reach straight back, attempting to keep the foam roll flat. As you move through a variety of planes of movement, you will likely find where you most need extensibility. Use the techniques and theory listed above to achieve optimal movement. In looking at the terms reciprocal inhibition, versus reciprocal innervation, we can think about the intimate relationship of opposing muscle groups and movement patterns. When there is a tight facilitated line in the body, there is likely a weak inhibited line as well. Upper and lower crossed syndrome, as coined by Vladamir Janda in the 1980’s, and popularised in the bodywork profession by Erik Dalton, PhD. today, is epidemic in a vast majority of our population. So what? If we stretch the tight line can that help make the weak line stronger? Structure before function. Function before form. That’s what. Here’s an example of a condition I see in my clinic often. Young adult, middle aged or elder man or woman. Forward head posture and shoulders rolled forward. Pain at the base of neck, upper back and shoulder problems/difficulty reaching over head without mild to moderate pain. The body simply can not continue to function, with out pain, if the structure is not ‘balanced’. Head on neck, neck on shoulders, shoulders over the ribs, low back balanced on pelvis, pelvis balanced on legs, and so on down to the feet….which is a book in it’s self. I digress. Back to the shoulders. Earlier we talked about ‘forward head posture‘. Often times when we balance the body, head, neck, shoulders it will realign the way the arm, humerus, sits in the ‘shoulder’, glenoid fossa, allowing for external rotation, and quit clipping the tissue of the rotator cuff under the acromion.